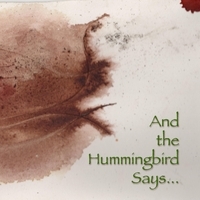 And the Hummingbird Says . . . is an interlinked song-cycle based on the ideas, words, and life of Kenyan environmentalist and Nobel Peace Prize laureate Wangari Maathai (1940–2011). Using the five Japanese Buddhist elements, the cycle moves from earth, water, fire, wind to void as the ultimate release from suffering, the transformative power of action without ego, the recognition of impermanence that is the deepest expression of the natural cycle, and a call for repairing the world in the face of devastating climate change. Written for four voices (soprano, mezzo-soprano, tenor, and baritone) sung a cappella. Incorporating Kiswahili (Kenya’s national language), and Kikuyu (Maathai’s native tongue), “Earth” explores the cultural, spiritual, and social fragmentation that followed when Christianity and colonization’s arrival in British East Africa. Voices plead for rain from Mt. Kenya (known to locals as Kirinyaga, or Place of Brightness) and from God. A Kiswahili hymn is interwoven with a British propaganda film, Maathai’s own rendition of the hymn, and thoughts on how a people strayed from the earth that gave them life, and the subsequent loss of culture and animals. “Water” uses two stories from Maathai’s life: how as a child she played in a stream that dried up when a sacred fig tree was cut down; and her sadness at the felling of a 200-year-old sapele tree in front of her. She recalls the cycles of nature and her place within the stream of time. One of Maathai’s favorite stories is of a hummingbird who tries to put out a forest fire using only the water she can carry in her beak, while the larger animals are fearful and mock her, telling her she’s too small and ineffective. She replies, “I’m doing what I can.” The song sets Maathai’s retelling of the fable amid voices of opposition, fear, or indifference to climate change. “Wind” focuses on the burdens women carry and their struggles to confront men in power. It draws its inspiration from the protests by mothers of political prisoners in Kenya that Maathai joined, and other demonstrations in which women stripped naked. The song reflects the misogyny Maathai experienced, and that all women are subject to every day. Maathai chose to be cremated in a coffin of hyacinth (an invasive species), papyrus, and bamboo (both renewable resources), rather than wood. “Void” explores the life-giving properties of womb-like soil and the cosmic material that is most of the known universe. Reflecting on how we as individuals, as a species, or conscious life can make a difference, The song rests in the ambiguities of sunyata, or “void”—wisdom from emptiness; emptiness from wisdom.